As we get closer to Meidum , we see the outline of a strange structure . What is this structure ? 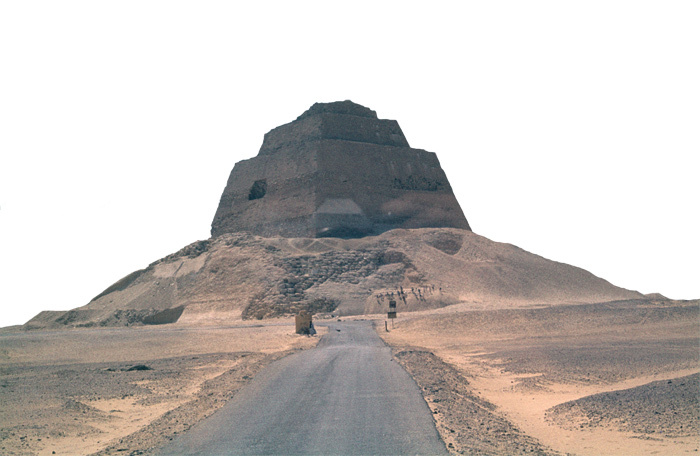 This is the remains of Snefru's Pyramid . It does not like a pyramid at all . True . It looks more like kind of a high , stepped tower , rising out of a tremendous heap of rubble. There are no inscriptions indicating who built it . King Huni's name is nor mentioned anywhere in the area . Several graffiti on and around the ruins indicate that the Egyptians themselves ascribed it to king Snefru (2575-2551B.C)Despite this fact , some people guessed that the pyramid was built , or mostly built , by Huni (2599-2575 B.C.) , last of the Third Dynasty Kings . Was it both kings who built it then ? All circumstantial evidence indicates that Snefru alone built it . But the people who insist that the Pyramids were tombs and nothing else , could not deal with Snefru having tree pyramids which , in their minds , means three tombs . this is the reason , they came up with the unfounded story , that Huni built (* or mostly built ) this pyramid . How was this Pyramid built ? The original plan of this structure was to build a step pyramid , and was later converted into a true pyramid with smooth sides .So , historically this is the first true pyramid . It was built in three phases . Each phase was intended to be final because the exterior walls of each phase , consisted of fine limestone . The first phase consisted of building a seven -tiered step pyramid , and it was finished by the customary casing of fine-grained limestone . it was 196'(60M) high. The second phase consisted of adding an eighth step , which received another layer of casing stones . The height then became 262'(80m) . 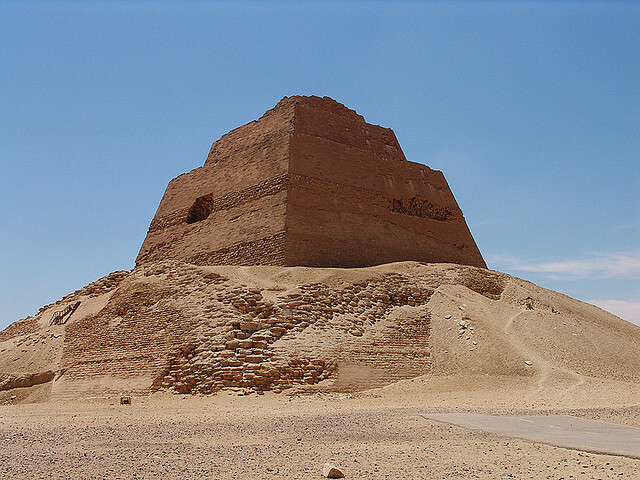 the third phase transformed the eight-tiered step pyramid into true pyramid with smooth sides . Packing blocks were added and a final layer of casing stones was laid at a steep inward angle , to overcome the side pressure of successive courses of masonry . How did the pyramid end up to the was it is now ? After the pyramid was completed , a few of the casing blocks were squeezed out of place , a chain reaction followed ,and the entire outer casing gave way . Much of the core masonry was pulled with the loose casing stones . As a result of this avalanche , a huge rubble heap was formed around he Pyramid , Which left portions of the earlier step pyramid intact . This explains its towerlike appearance . How do you know that the collapse occurred after the pyramid was completed and not during the pyramid construction ? The presence of the mortuary temple next to the collapsed pyramid proves that the collapse occurred after the pyramid was completed . They would have not built the mortuary complex , next to the pyramid , if the pyramid actually collapsed during construction . To add a mortuary complex , Next to collapsed pyramid , is a moot and dangerous undertaking . The blocks of this pyramid are larger than the precious three pyramids .Right ? Yes . Some of its blocks weigh about 550 pounds (250kg) . There is no evidence of these stone blocks being quarried locally or otherwise . On the other had , records in the mines of Sinai indicate vigorous activities during Snefru;s reign .Again showing that arsenic0 minerals , need for the production of man-made limestone blocks , were extracted . How about the interior rooms ? there is only one small room , with no inscriptions , which has a fine core belled roof ( fashioned like steps in reverse ,) composed of seven steps . Access to the room can only be achieved from the corridor via a narrow vertical shaft . The interior . The interior room is set at the top of the shaft . This vertical shaft enters the floor of the rooms and is only 1.8'*2.8'(117*85c) wide . None , Totally empty . There was never a stone chest there m because it would have had to be placed in the room at the time when it was being built in ancient Egypt, and it could not have left the room b the narrow shaft , except if broken into pieces . No granite in the room itself or anywhere in the corridor. What is the significance of building a true m rather than a stepped pyramid ? 2 - The bases of the Medium and all future stone pyramids are set along meridians . As such , each side of the square bases face one of the four cardinal points (north , south , wast and west). 3 - From the Meidum Pyramid onward , the entrance to all masonry pyramid was will above ground . The interior rooms were mostly located at the base of the pyramid itself .. Bringing a heavy stone chest in and out of the above -ground entrance would have necessitated the is of a substantial ramp . However there is no evidence of the use of temporary of permanent ramps whatsoever . 4 - This and all subsequent ,masonry pyramids share the same pattern of a noticeably low and narrow passages , which lack adequate space to move around , or stand up straight . 5 - The narrow entrance passage is always directed like a telescope towards the celestial pole . 6 - A small enclosure and a mortuary temple with a cause to the river , was repeated in all the subsequent pyramids .